Again those seem to be at least partially below the plaza level. The e was no OOS flooring and the bracing in the long axis of the core appears to be different than it is where there is OOS flooring which had a belt girder surrounding the core. This appears also to be below the below the lowest express elevator. Perspective makes it hard to read elevation. Note also very similar amounts of smoke. Shows what looks like a few more columns on the north end of the core extending higher than the Jacobs Oct 31 photo, suggesting they were cut between these two dates. Are there any phoots of what it would look like if Thermite, Thermate, Micro-Thermite, or some other mysterious chemical had cut through this size column? Does AE have a test subject that they created using Therm. that looks as precise as this angle cut? It is interesting that Gage uses the jagged, uneven cut beam at the memorial in Manitoba to illustrate that it was not cut by a torch, but then says that this column ws, when it is clearly not jagged and uneven! Here is the link to the thread from Metabunk: "A&E911 analysis of slag residue...."
Brown's exhibition website dates this photo to 9 am on October 7, 2001. It appears to have been taken from the west with one of the Brookfield Plaza buildings in the foreground on the left. It's hard to make out exactly, but I believe this photo shows that the column in question remained mostly buried at that time. Amazingly, the folks who retained Brown never had him sign an appropriate intellectual property rights assignment with respect to his photographs and, as a result, he retained the copyright to all 30,000 photographs he took at FEMA's behest. This was a colossal blunder to say the least and likely why there are so few of his aerial photos publicly available. Overall, however, I have to say it's a bit disappointing that there hasn't been a concerted effort to collect and archive all of the photographs, at least so far as I can find. The technical accounts are of little interest to the public who accept that the planes were the root cause which let to the towers collapse and that unfought fires did in 7wtc. However for the historical record and for those who want to drill into the mechanics of the collapse all photos and witness reports as well as technical reports are important. Some more digging for documentation of early ground zero led me to a website maintained by the NY National Guard. There are two videos (1 and 2) there that contain interviews with guardsmen at ground zero on September 20, 2001, when the recovery effort was still in its frantic infancy. Included in these videos is some incredible footage of the north tower rubble that really gives great context to just how huge the pile was in the area where AE911Truth alleges without basis that the angled column was precut. The relative sizes are much easier to make out when watching the zoom in the video. I agree with Jeffery that AE911Truth's claim is thoroughly rebutted. They have not presented any evidence that the column in question was precut and we now know it was deeply buried in the rubble and out of sight immediately after the collapse, and it almost certainly was cut by iron workers during the course of debris removal. and it almost certainly was cut by iron workers during the course of debris removal. considering we have photos before they were cut (October 2001) .. I'd say that kinda verifies they were cut during clean up. Agreed. But, to play devil's advocate, I'm sure AE911Truth would say that they believe the column was still precut and then buried. The issue with that claim isn't that it's impossible, but rather that there is simply no evidence for it (and ample evidence for the alternative theory given the photos and testimony documented in this thread, but let's put that aside for a second). If there were photos of the column cut immediately after the collapse at a time when it was unlikely that iron workers could have made the cut, then they'd have an inference against the cut being made by a iron worker. But since the column remained buried for at least a month, we know AE911Truth's photo cannot give rise to that inference. This directly contradicts the caption in the AE911Truth slide that states their photo of the angle cut was taken before iron workers were at ground zero and so we know that caption is patently false. AE911Truth is factually wrong on the timing of their photo without any doubt. AE911Truth also raises issues with the visible slag and the angle of the cut, but those have also been addressed in this thread. I'm sure AE911Truth would say that they believe the column was still precut and then buried. looking through apimages... it looks like those beams were cut down to the OP pic October 29th. I used search "world trade center" then dates from nov 5-oct 25th I think. Lots of focus on that area at those dates. see lots of beams being cut, firefighters spraying, firefighters finding their colleagues in the immediate area , etc. it all explains the oP pic quite well. Agreed. There are some photos that seem to show larger column and beam assemblies at that location on 10/27 and 10/28, and then a number showing cut back columns in the area starting on 10/30 (though its hard to make out whether the diagonal cut column is there and cut as such from the low res, non-licensed preview photos). That's definitely a great way to photo hunt for across a tight time frame. AE911Truth obviously never took the time to do so and check its facts. 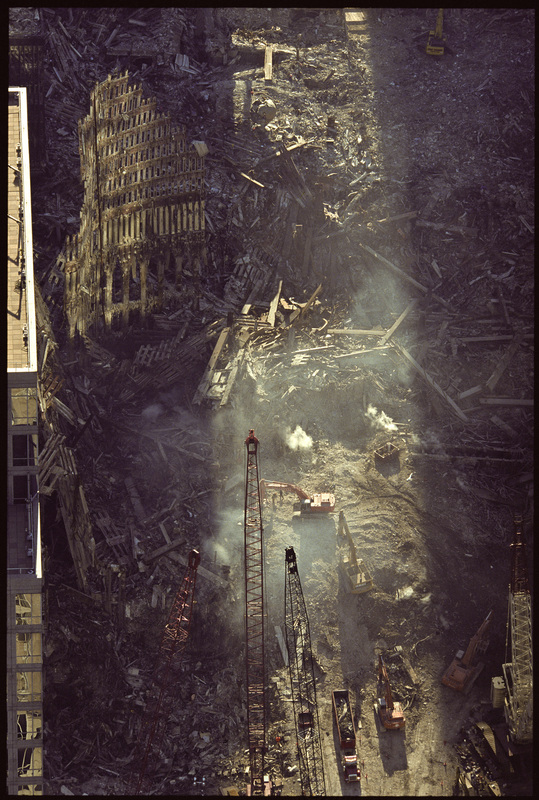 Are there any other photos AE911Truth holds out as photographic evidence of the effects of thermite or explosives? We could probably debunk the lot in short order at this point. It's a pretty glaring hole in AE911Truth's theories if they cannot produce a single photo of the rubble that actually evinces the effects of their alleged controlled demolition. 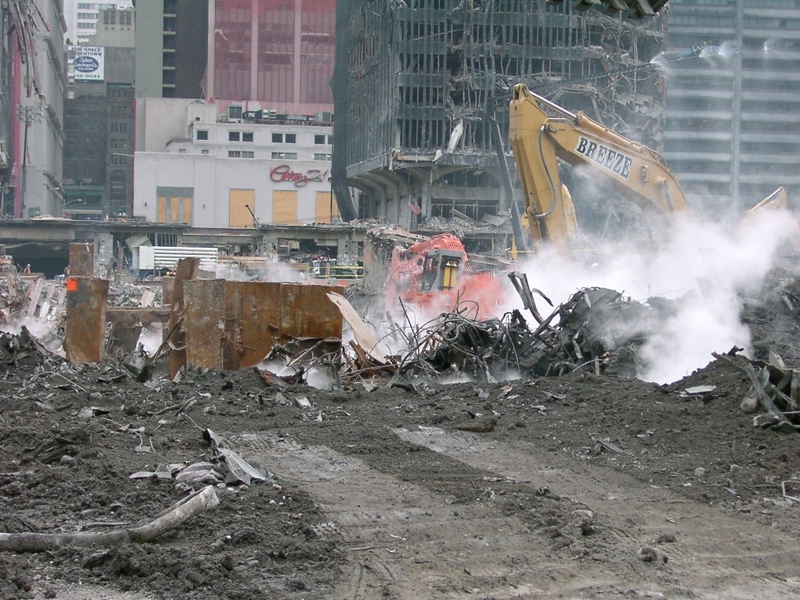 Over the last few days I realized I had previously just scratched the surface of the sheer number of ground zero photos and first hand accounts that exist. My library is about 15 books richer for the search. I think you can post the watermarked images you get with "download comp", or in the preview. You can get a higher resolution copy with the cheapest license for about $30, which allows you to display it on the internet for one day. Most of the AP images don't seem to exist anywhere else. Which means that the angle cut is likely here - in this very rough match to the above photo. That's column 504. @gerrycan told me he think's that's the angle cut column. Alright, then this one is case closed as the following photo (previously posted by Mick) clearly shows the column was not yet cut at an earlier point in the recovery. The top horizontal green line is the top of the second lobby window level. The bottom green line is the top of the first lobby window level (which is the floor). Mick already established that the angle cut column's top was roughly at the floor level. We can use Mick's diagram to see that column 504 was roughly in line with the 11th exterior column from the northeast corner of the building and we can count over to that column in the picture (long vertical green line) and then use the perspective to roughly trace it down to where it meets the floor level (short green line). If you then use the photo's perspective to roughly run a line at floor level (the blue line) to column 504 (extended by the lower yellow line), we can see clearly that the angle cut must have been made below an area of the column that was intact during the recovery (where the blue line meets the line yellow). It's another incredibly clear view of column 504, which remains standing above the height to which it would later be shortened via the angle cut. Right where we thought it was. The pic actually caught the very moment the upper part of the column is falling to the ground! Thanks to @deirdre for finding the better "before" photo. Isn't that (the column falling to the ground) actually the column immediately to the right of the famous one? Not that it makes any difference as they were clearly still joined together shortly beforehand! It is, I though I'd matched it with the rust patterns. But they have similar rust. Still the comparison allows to match the base of the cut column to it's intact base. Yes, the bent bit of crossbeam at the upper right is the giveaway, and the fact that it still seems to be attached (or nearly so) at the base). It doesn't make any difference to the debunking, though, as the "before" image shows that it was attached to the column in question by the crossbeam, which is photographed being cut on the same day, with the other column standing. This thread represents a truly amazing bit of sleuthing, by the way. From a single, undated, fairly close-cropped image of a column, to not only identify the column but to track down dated photos of it being cut down is very impressive! Maybe not helpful in locating the exact column at issue here, but one of the on site engineers who oversaw the demolition of the remains of the towers wrote a book on the experience, in which he detailed to some extent how such columns were cut and removed. Somewhat off topic, but I found that book (After 9-11: An Engineer's Work at the World Trade Center) at my local library and read it. It was (IMO) an interesting look into what it took to remove the remains of the buildings and the toll it took on the people who were working on the pile. is the one actually being removed here? It looks as if the cut on that column was lower than on the angle-cut one we are talking about, which fits the positioning. That one seems to have been cut more straight across, though. A team effort! Thanks everyone. Once we'd identified the correct location I collected photos from this viewpoint, and stitched them together. The AP photos are only available as these comp images, and the majority are found nowhere else on the web as they are all rights managed. Much higher resolution images are available, for a cost. It's sad that such historical photos are essentially hidden away for decades to come. Do you agree that the column shown by Ae911truth as evidence of CD was actually cut by the Recovery team? I say this is debunked. The lack of Truthers chiming in is probably a pretty good sign that they have nothing to add. I join the question from Tomi and I would also like to read an answer from you about that. thanks in advance. I have to find this book, I think. Every time I look at pics of the debris it never ceases to amaze me, the sheer scale of it all and the massive undertaking of restoring the area. 9/11 was one of the reasons I came to this site, and this kind of resourceful use of open source pics and careful comparison of evidence is why I still come here. Top effort digging through all of that for a resolution! Back on topic - certainly the argument was put forward time and again that the column was cut during the rescue/cleanup stage? Have AE911 rebutted it in the past? Also, though maybe speculation on my part, if the cut were made prior to the building falling, it's not likely to show fresh, neat square edges around the cut. Some sort of deformation would occur to the edges if thousands of tons came down on it and around it. Another fair assumption would be that the hollow interior section of the column would be filled with debris, as the workers aren't likely to waste time cleaning out the interior of a column which is to be scrapped (if that is even possible). Background matches with the original photo. So verified by photos from two independent sources. I agree. There's stuff like closeups of the ends of giant core columns where you can see just how pitiful the partial penetration welds were in some places. Should be required reading before any debate. Do you agree that the column shown by AE911 Truth as evidence of CD was actually cut by the recovery team? I would also have expected staunch AE911 supporters like @John85 to have spoken up by now. I have seen references to columns cut like this in various materials, but my beliefs regarding the events of that day do not depend on them. This is a soft target for debunkers that doesn't deal with the most important evidence. The thread was about a column that AE911T claimed was evidence of being cut pre collapse. It has been shown that AE911T position is not correct. The column was not pre cut by nanothermite or any other means. If nothing else, it's watertight evidence that 'Truthers' have jumped to conclusions and presented misassumptions as hard and apparently convincing (to them) 'facts'. And if they're wrong about this, what else are they wrong about? That's the question I would be asking were I a 'believer'. I have been in the precision metal trade for 24 years now and know quite a bit about steel columns and how they are cut, and the characteristics that go with that...I will say that with 100% assurance, that was not cut with a torch, in fact, it is impossible to make a cut like that with a torch, or any other hand held instrument. That I am sure of. It's absolutely retarded (to me anyway) that anyone would even consider this column was cut during the clean up....and criminal. the real question is, will Truthers on OTHER forums be honest and explain the mistake when it is repeated.